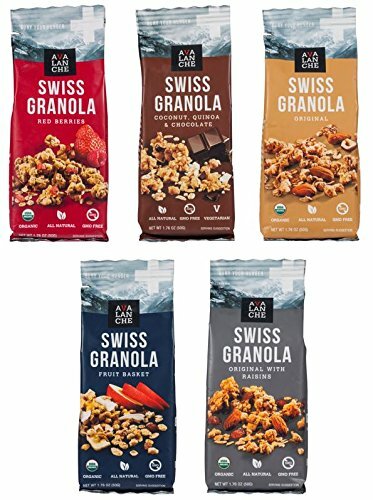 A DELICIOUS AND NUTRITIOUS CHOICE FOR BREAKFAST: 6-pack, Avalanche Swiss Granola, 1.76 ounce pouches, Baked in and imported from Switzerland. The grab and go granola that will bury your hunger and fuel your body and soul for endless adventure. BAKED LOW AND SLOW IN SMALL BATCHES: Avalanche Granola is baked low and slow on a 131ft oven. This method bakes more evenly and produces the perfect texture, slower roast brings out more flavors, maintains larger clusters and creates a better taste. WE SEAL IN THE FRESHNESS FOR YOU: After Avalanche Granola is prepared with care it is then packaged to retain freshness until the first bite. Each foil pouch goes through a nitrogen flush to keep out moisture and oxygen for a crispy and crunchy granola. AN AVALANCHE OF CRUNCHY FLAVOR: If you've tried Cascadian Farms Granola, Love Crunch Granola, Quaker Natural Granola, Bear Naked Organic Granola, 18 Rabbits Organic Granola, Purely Elizabeth, or Nature's Valley Granola Crunch you'll love Avalanche Granola. Final Price as low as $8.91 Shipped!